Give your trodat™ self-inking custom dater new life with a replacement ink pad. Delivers up to 10,000 impressions. Plastic case around pad. 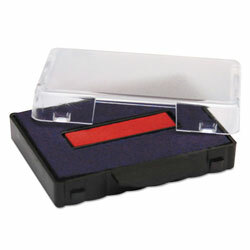 Ink Pad Type: N\A; Refill(s) For: trodat™ Custom Dater (USST5430); Ink Color(s): Blue; Red; Size: N\A. Stamp Pads and Ink Refills from U.S. Stamp & Sign! 378 In Stock today.